One of the astonishing moments of gameplay comes, when out of a set of very simple rules and playing material an incredible dense and dark forest of actual play emerges. Gripping storylines, high emotions, alliances and conspiracies, endless possibilies. I dare say that this most often happens, when natural language and roleplay is part of the game; as it is with „Mafia“ or its fantasy variant „Werewolf“. I played „Werwolf“ nearly ten years ago for the first time, and since then it has become a staple of our parties with more than 10 players – one of the few games that can handle up to and more than 20 people (which requires an experienced gamemaster, though). The first commercial version I played had only three different kind of roles/cards, the drawings were crude, but the gameplay was extremely exciting. Immediately I wanted other roles, with different traits and motivations; better drawings; more cards! And a nice box to keep them in. The game is described quickly: Villagers have werewolves hidden among their midst, who kill during the night, but may be lynched during day by the townsfolk; they just have to agree who is a prospective werewolf. Foggy accusations and two-faced backstabbing: Hilarity ensues. A gamemaster coordinates the nightly and daily actions; everything can be played around a table, as long as everybody can see everybody else without moving around. Playing time depends on group size and mood, but with a dozen people already familiar with the concept gameplay usually lasts about 20-30 minutes. You may want two or more rounds, though, just for balancing, rolechange and revenge. Much of the fun of the game stems from roleplaying the villagers, hiding their true miscreant or benevolent traits; and from the gamemaster describing the bloody result of a night with a werewolf on the prowl. The game itself is quite fascinating from a theoretical, maybe even a didactical point of view, because until later on in the game there are no clues as to who really is a threat to the villagers. The first mob lynchings thus depend – or have to depend – on vague suspicion and personal animosities. These dynamics lend their hand to other incarnations of the game like the „witchhunt“. A version with a terrorist theme may also a viable option, it would be interesting to compare the emotional effects on having different narratives with the same playing mechanism, some more ’serious‘ or ‚real‘ than the fantasy setting of „Werwolf“. Dimma Davidoff (…) is generally acknowledged as the game’s creator. He dates the first game to spring 1986 at the Psychology Department of Moscow State University, spreading to classrooms, dorms, and summer camps of Moscow University. (…) He developed the game to combine psychology research with his duties teaching high school students. The game became popular in other Soviet colleges and schools and in the 1990s it began to be played in Europe (Sweden, Germany, Romania, Slovakia, Czech Republic, Hungary, Poland, England, Norway) and then the United States. I started to develop my own version of „Werwolf“ in 2001, which now, in 2011, sees its second edition. Drawings and design by me, CC non-commercial & share alike. You may download it, print and cut it out; all for fun – no commercial purpose. There’s an english and a german version; rules are – yet – just in german. Link to extensive Werewolf-Ressources with hundreds of new ideas at Boardgamegeek. 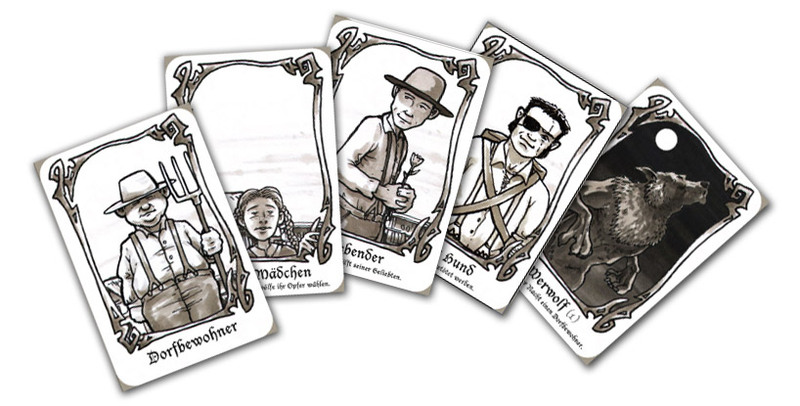 Especially nice idea: Give every player an artifact to get around the first-day-syndrome and the I’m-just-a-lousy-villager-complaint: Link to list of artifacts at BGG. Maybe an inclusion for my 3rd edition. Dieser Eintrag wurde veröffentlicht in gamedesign, games, ideas for games und verschlagwortet mit rollenspiel, werewolf, werwolf von Wey-Han Tan. Permanenter Link zum Eintrag. Your version of Werwolf is fantastic! I really like the attention to detail and the new roles. Can you tell me if there will be an english translation of the rules? Thanks, great that you like this version. I’m workin on an english translation, but time is a scarce ressource for me, and there’s always the temptation to expand the existing game of Werwolf with new roles, artifacts; or turn the gaming mechanics to something non-elimination, e.g. „The Resistance“ etc. I adore you for this work or art, this is what I’ve been looking for a long time. A really big thank from Vietnam. I hope once day I can share my own version to you. Thank you – I hope you enjoy playing it!